Grow this hardy, fast growing Mitragyna speciosa tree almost anywhere! Kratom seeds are extremely difficult to come by because the tiny pods explode, and the sliver-size seeds disperse into the air since. But, we managed to harvest the Kratom seed pods just as they broke open and released the seeds. Due to the extremely small size of Kratom seeds, packets are sold by weight, and not by number, but a packet contains approximately 150-200 seeds! 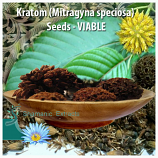 Kratom seeds will germinate in almost any cool to hot environment. Mitragyna speciosa is a beautiful, hardy, and extremely tall tree, sometimes reaching heights of 30 meters! The seeds produced by these trees couldn't be more delicate; they grow in podheads, that contain about 50 seed pods per head. Because the seeds are so delicate and so many, they also have a low germination rate as well. Open the seed pod and get the small seeds in side. Prepare for the standard potting soil and drop the small seeds between 5-10 seeds per pot on to the top of the soil. Sprinkle a very thin layer of soil on top, just ehought to cover the seeds. Dont let the soil dry out, but dont soak it either. Spray with water every day morning and evening and keep under the shady place untill the seed become sprout (it's will take 6-7 days) after that move the sprout under the sunlight. The temperature about 75-85 degrees fahrenheit.